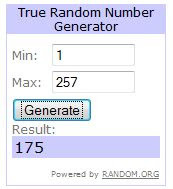 Congratulations Adri17 (comment no:175), you have won Perricone MD Cold Plasma worth $150. (Her mandatory entry comment is here, comment #69 ) . I have sent you an email. Please respond immediately with your full name and address. A big THANK YOU to all those who participated in this giveaway and made it a huge success.If you didn't win this one, don't worry; there will be another giveaway tomorrow, Friday (Aug 20, 2010); you could try your luck in it! !